DuPont™ Pyralux AC® is an all polyimide single-sided copper-clad laminate used for various electronic applications including flexible circuit manufacturing. Pyralux AC is available in a wide range of thicknesses and grades of copper. The Pyralux AC product code chosen for laser compatibility testing was AC 352500EY which consists of a 35µm thick layer of electro-deposited copper and a 25µm thick layer of polyimide. A diagram depicting the layers of the Pyralux material is shown in Figure 1. Figure 1. 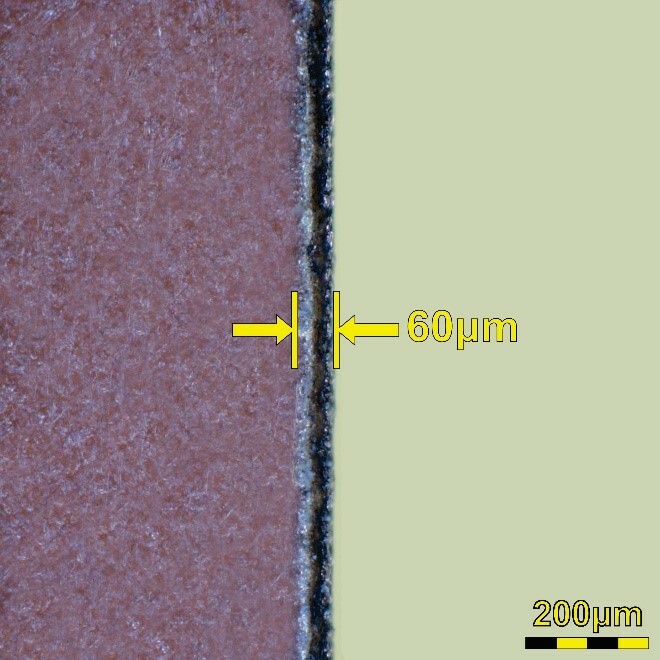 DuPont Pyralux AC 352500EY diagram showing the 25µm thick layer of polyimide on top of the 35µm thick layer of electro-deposited copper. Pyralux AC is primarily used in the manufacturing of multi-layer flexible circuits, made by laminating layers of Pyralux AC together. First the circuit patterns are formed by selective removal of copper from the polyimide substrate using a photochemical etching process. Then, small vias must be formed to make connections between the circuits on each layer of Pyralux AC. The layers go through the laminated process and finally, the outside shape of the flex circuit is cut from the multi-layer sheet. Laser processing provides a method to remove the polyimide from the copper to create the small vias needed for connecting circuits together between layers in multi-layer flexible circuits made from Pyralux AC. Laser processing also provides a method of cutting the outside shape of multi-layer flexible circuits made from Pyralux AC without the need for tooling and the ability to create small fine geometry that can be challenging to achieve using traditional mechanical methods. Universal Laser Systems makes it simple to consistently and repeatedly process this type of material to a high degree of dimensional accuracy because the non-contact nature of laser processing eliminates material deformation during processing. DuPont Pyralux AC was tested to assess laser processing compatibility and to determine the most favorable configuration of laser power and wavelength for each process. 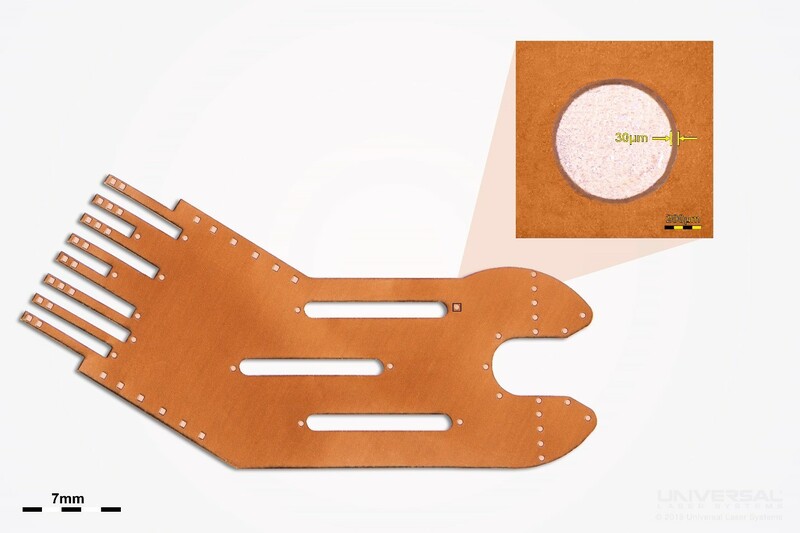 Laser cutting of the copper layer requires the use of a 1.06µm wavelength laser, as copper absorbs this wavelength efficiently but is reflective to both the 9.3µm and 10.6µm wavelengths. Laser cutting of the polyimide layer requires the use of a 9.3µm or 10.6µm wavelength, as polyimide efficiently absorbs these wavelengths but does not readily absorb the 1.06µm wavelength. The combination of these two lasers in a simultaneous beam, utilizing MultiWave Hybrid technology, produces a clean edge with minimal heat affects. An image of the edge is shown in Figure 2 at 300x magnification. A small amount of debris is produced during laser cutting and is easily removed with a mild solvent, such as isopropyl alcohol, and mild abrasion or sonication. Removing the polyimide from the surface of the copper layer requires the use of 9.3 or 10.6µm wavelength laser energy. The polyimide layer efficiently absorbs these wavelengths but does not readily absorb the 1.06µm wavelength. However, Multiwave Hybrid™ technology can be incorporated into the selective ablation process to reduce post-processing by etching the copper surface to produce a smoother, cleaner surface. Otherwise, additional cleaning using a solvent such as isopropyl alcohol and abrasion is necessary after selective ablation. The 1.06µm laser energy, combined with the 9.3 or 10.6µm laser energy, performs both the selective removal and cleaning process at the same time. 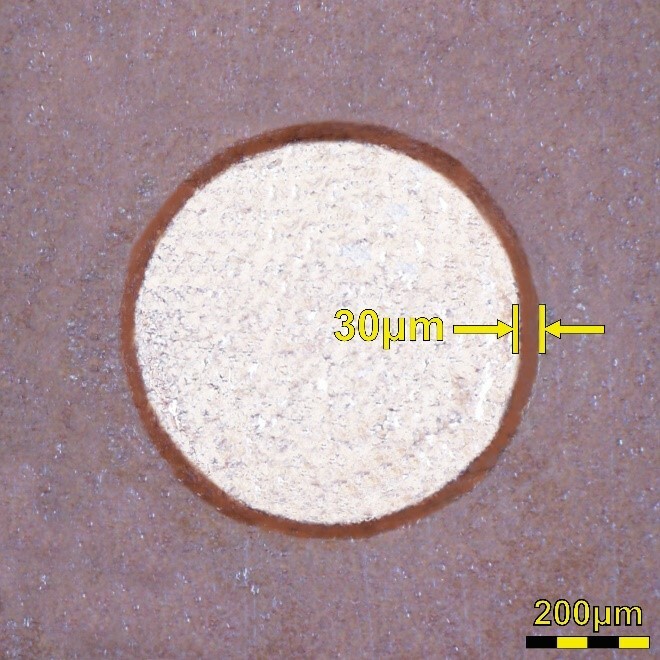 An image of the copper layer with the polyimide laser-removed is shown in Figure 3 at 300x magnification. A small amount of debris is produced at the edge of the ablated area during the processing of this material and is easily removed with a mild solvent, such as isopropyl alcohol, and mild abrasion or sonication. Figure 2. Microscopy image (300x) of the edge after laser cutting DuPont Pyralux AC. The heat-affected zone measures 60µm. Figure 3. Microscopy image (300x) of selective ablation of the polyimide layer exposing the copper substrate. The heat-affected zone measures 30µm. Further inspection of the edge after laser cutting shows that the polyimide and copper laminate is cleanly and smoothly separated along the processing path with MultiWave Hybrid technology. Figure 4 depicts a 3D-rendered microscopy image of the edge as shown in the Figure 2 microscopy image. Inspection of the area after the polyimide was removed, exposing the copper layer, shows a clean, smooth surface with no remaining polyimide. 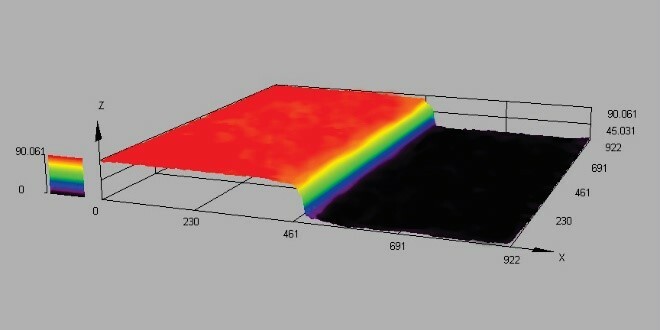 Figure 5 depicts a 3D-rendered microscopy image of the area after selective ablation of the polyimide layer as shown in Figure 3 microscopy image. Figure 4. 3D-rendered microscopy image (300x) of the edge after laser cutting the Pyralux AC. Figure 5. 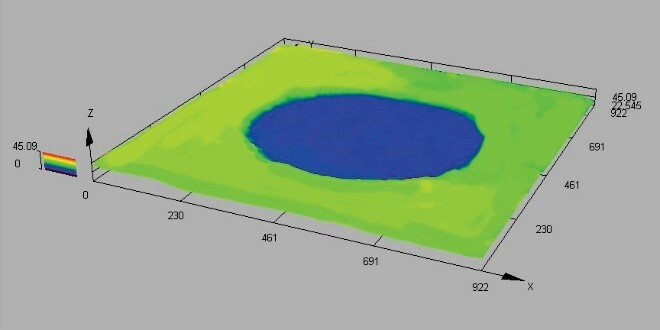 3D-rendered microscopy image (300x) of the area after selective ablation of the polyimide layer. DuPont Pyralux AC applications requiring fine geometry and intricate detail can be achieved with Universal Laser Systems technology. An example demonstrating the results of laser processing DuPont Pyralux AC material is shown in Figure 6. Figure 6. Example of the fine geometry possible with laser processing DuPont Pyralux AC. DuPont Pyralux AC is suitable for laser processing and was extensively tested to determine the most efficient processing configuration. Through this testing it was determined that laser cutting and selective ablation of the polyimide layer to expose the copper layer are viable with this material. The copper layer efficiently absorbs the 1.06µm laser wavelength and the polyimide layer efficiently absorbs the 9.3µm or 10.6µm laser wavelength, making the combination of a 50 watt 1.06µm and either a 75 watt 9.3µm or 10.6µm laser utilizing the MultiWave Hybrid technology the required configuration for best results.